The last couple of weeks have flown by- I feel like I’ve hardly stopped to take a breath. 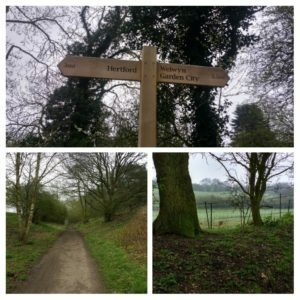 After my little parkrun adventure to Northala Fields, on the Sunday I decided to run along Cole Green Lane, which is the old railway line near me. It was my first run of the year along that way, and I thought it might be muddy but it wasn’t too bad. I did an out and back route for just over 7 miles. 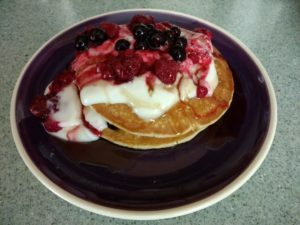 When I got home I had a cheat’s version of Cafe Coho’s pancakes- pancakes topped with Koko yoghurt and defrosted summer berries. Tuesday- only just made it to running club where I wished I’d worn a vest and not a t-shirt as it was so warm (it was 26C at 7pm!). Wednesday- lovely yoga of course. Thursday- a yoga session at work (someone has started coming in for the staff which is brilliant). 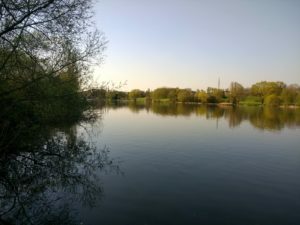 As I don’t like to run for 3 days in a row (and like to run on Saturday and Sunday) I tend to do a 4th run on a Thursday, so I stopped on my way home for a short run around the lakes. It was so hot (28C) and I rushed home for a shower as then we were off to see Grease at the cinema. Friday- I stopped off to see my parents on my way home from work as it had been my mum’s birthday- we sat out in their garden for ages and it was just lovely. Saturday- I met Dad at Ellenbrook Fields. We ran together and until the final mile I was managing to chat to him. I finished in 27.12 which matched my first ever parkrun time at St Albans. When I mentioned this to Dad he told me that I really should have run more slowly at the start to give myself a chance of getting more pbs! After pancakes at theirs, Dad offered to help clear some of the junk from behind our shed (left by the previous people), so we spent a while in the garden clearing out so much rubbish (old incinerator bins with no bottom, lumps of concrete, bits of old trellis and broken bird feeder tables…). Andy’s parents then came over, bringing us some plants they had kept in their garden for us. We all headed off to Crews Hill for the garden centre (it is basically a road with garden centres lining it). Once we got home we had to spend another hour or so planting everything. After having our new fence put in the other week, we can now actually start to plant close to it now. We’ve got a couple of little crab apple trees, and bought a few other plants (some gorgeous blue ones) to go on that side by the blue shed. One the other side we had a few gaps, so got some pink plants to go on that side, as we have a pink magnolia and a little apple tree with pink blossom. 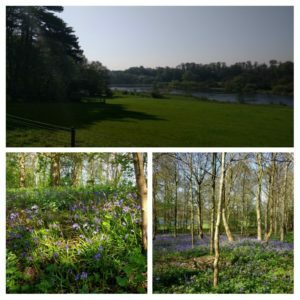 On Sunday morning I went for a run to Panshanger park- our clump of bluebells had started to flower in the garden, so I thought they might be out in the park- I was right! It was such a beautiful morning, and the bluebells looked amazing, but again it was really hot and I felt pretty thirsty by the time I got home. I’d only run 9 miles (compared to the poor people running the London marathon). I’d taped the race so after a shower and breakfast I sat down to watch it while I got on with my work. It was pretty exciting, but I don’t envy the runners at all. 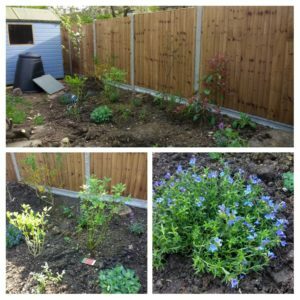 Once the work was finished, I went into the garden with the aim of weeding a little area at the back. There were (or so I thought) a few lumps of concrete, but it turned out that the entire bed was made up of concrete lumps covered with a thin layer of soil. I managed to lift most of them, but some I could only flip over. 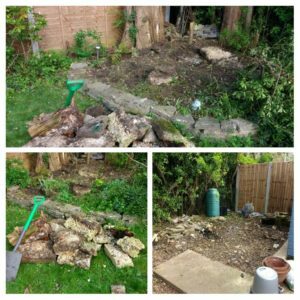 (Flower bed and lumps of concrete, plus the newly cleaned area behind the shed). What I thought would be a quick job took me 90 minutes- who needs a gym? This week has been just as busy- on Monday evening I was out at the Herts parkrun volunteer evening (which I’ll do a separate post about). On Tuesday our club run was aiming to be 3.7 miles for the runner who died 3.7 miles from the end of the London marathon (you can donate to his Just Giving Page here). We did an out and back to try and get the distance right, and it was pretty chilly each time we stopped to regroup- such a change from the previous week. One of the people out running had run London on the Sunday and was telling us about it- it seems that so many people started too fast (for the heat) and she had not seen that many people collapsing before. Wednesday was yoga, and Thursday was yoga, run and cinema (Rampage= questionable CGI but totally relaxing as it was just silly). 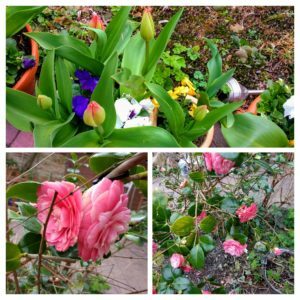 Where has the spring gone? Do you have summer and winter running routes? So on the final Saturday of the holidays I decided to have a little parkrun adventure on my own. 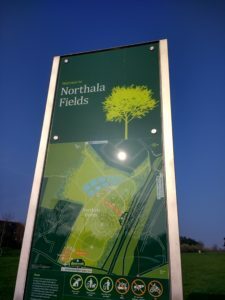 I looked at a a few options including Valentines or Victoria Dock for a V, but the train + tube times were adding up, so in the end I went for Northala Fields- I would tick off the N, and also complete the compass challenge (having already run Eastleigh, Southampton/South Oxhey and Westmill). 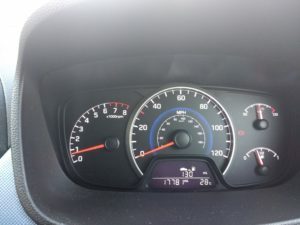 It meant I had to drive, and although it was 45 minutes away, this was on the M25 so I left at 7.45 to allow loads of time. The journey was actually really easy (even for me)- M25, then M40 into London, which would then turn into the A40, and then at some point (when the satnav told me, and also when the big mounds appeared to my right), exit and turn right. The car park was right there, although filled with the most enormous pot holes so I did briefly worry about getting my car stuck! 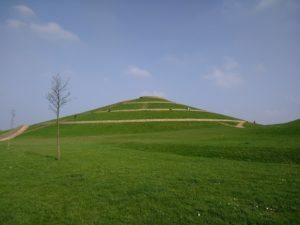 Northala Fields have these cool hump hills, which were from when the original Wembley stadium was dug out. 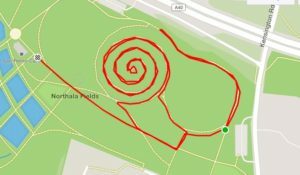 One of them has a path spiralling all the way around to the top, so of course I had to run it to get the cool shape on Strava! I had a little wander around before heading up. It took longer than I thought- I’d run 0.8 miles and it was getting closer to when they would do the new runner briefing, so I took a few moments to enjoy the view before heading back down. It had boards up showing what you could see- the weather was beautiful but a little hazy so I couldn’t see everything on the boards. I had planned to put my long sleeved top in the car before the run, but as time was getting tight I tied it around my waist instead. I headed along to the briefing, where all the tourists were given a lovely welcome. I saw a few other people with their cow cowls and said hi to them (although they were from Guildford and I just could not remember where it was at all- my geography is not great as if two places begin with the same letter I get them muddled). 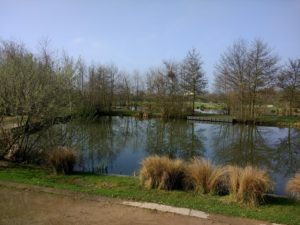 The guy doing the briefing had been to Panshanger and said how beautiful it was (it really is)- it was on the parkrun profile this week so check it out if you are interested. The main briefing was great- they had big pieces of paper for the milestone people to hold (eg a big purple 25, a red 50 and so on)- the people celebrating milestones stood on the bench holding the paper, so that even if you could not hear the briefing, you could see who was celebrating. The course was busy with just over 300 runners. 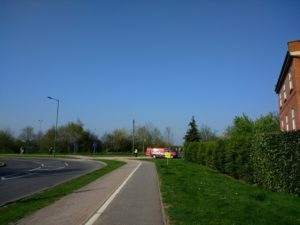 It started off on a fairly wide path with grass on either side, so even though (again) I started a bit far back, I managed to overtake people and get into my stride. 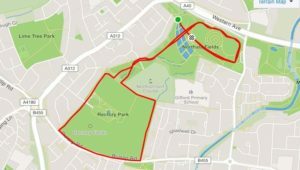 The route looped around the back of the spiral hill, went past the start/finish area through some wooded parkland and then around playing fields. The view from outside the cafe- you ran past this to get to the playing fields section. I like to take a picture of my finish token, and as I was getting my phone out, Bruce Li (who takes brilliant parkrun photos) came and asked me if I wanted a finisher photo. I agreed (we all love a photo at parkrun) and then I chatted to him for a bit. He saw I had Panshanger on my t-shirt, and then I realised that he had visited Ellenbrook and created a video of the course. It was really lovely to chat to him- he told me that as this is his home run he takes photos at the start, runs it (in around 20 minutes I might add!) and then takes finisher photos for as many people as possible. 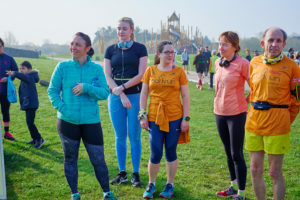 What a lovely way to be a part of the parkrun community. I did look in the cafe as I had heard good things, but there was a huge queue and I could only see cooked things on offer- I was hoping for a toasted teacake or something. I had a nakd bar and some water in the car so in the end I headed back and did some stretches before driving home. So, another letter added, and a new club achieved (totally unofficial of course). I think every parkrun is worth visiting, but this one felt quite special. The spiral was good fun, and the local just felt really different to other parks. 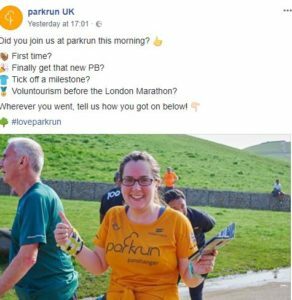 Then this week I got a message from someone saying I was on the parkrun instagram account (and also on the facebook page it turned out)- they had used one of the photos of me at the finish for their post about where everyone had been this weekend- fame at last! If you like touristing, how do you decide where to go next? Easter holidays part 2 including number 100 at number 100! Onto the next part of the Easter holidays (which was now over a week ago! 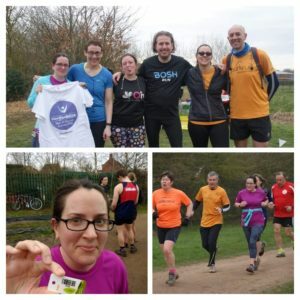 ): Saturday was Ellenbrook Field’s 100th parkrun! I met Dad there (he had cycled and I drove) and we ran together. At the start they remembered the runner and also the mayor who had both died recently and been involved in parkrun. They also mentioned something about the 100th runner, but I didn’t really hear that. Ellenbrook at the moment has many puddles- last week the finish runway was completely submerged (you can see the photo on their news page), and this week the runway had totally dried up but there was a huge puddle at 3.5km. We ran together, and when we reached the puddle there was a choice of a diversion through a field- we went for that as the puddle was knee deep on very tall people, and the ground is very rutted so as you could not see the ground it would have been easy to fall and twist an ankle (you can see the little diversion we took in the map above). At the end of the runway I said to Dad that he could push on if he wanted to, as he is faster than me. We had kept a good pace (9.05, 9.07, 9.04) and he thought about it, but then decided that we would finish together. As we ran past the start, we pushed a little to try and overtake a couple of other runners, and as we reached the finish we could hear the volunteers shouting out numbers- 98, 99- I got a big cheer as Dad let me cross ahead of him and I was given token 100! After chatting for ages, I headed to Mum and Dad’s for pancakes. My sister and niece were there, so it was lovely to spend time with the family. 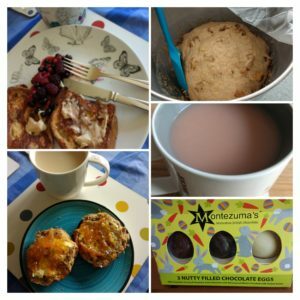 Panettone French toast for breakfast one day (we still have some in the freezer left from Christmas), hot cross bun dough, pink tea (Bluebird Red Velvet), yummy Montezuma’s eggs, and home-made hot cross bun toasted and topped with marmalade. Later on Saturday afternoon Andy’s parents came over, so I made some hot cross buns. We had asked to borrow some hedge cutters as we needed to trim a rather out of control hedge in preparation for our new fence being put up, and Andy’s dad ended up helping with it and spending a few hours in the garden cutting it down with Andy. The garden has started coming to life a bit more now- some of the tulips are flowering so there is a bit more colour. On Sunday I had a longer run in the morning, 7.5 miles, before it started raining too hard. I spent the rest of the day doing work, before having a walk in the late afternoon to get a bit of fresh air and stop looking at a screen for a bit. I did a little more wallpaper stripping too- it’s getting there slowly. It was Andy’s birthday on Monday, and he had taken the day off work so we walked into town to get the train into London. We went to the Museum of London, which I’d never been to before. It had the 2012 cauldron and lots of information about it (each part was shaped differently and given to the countries that took part after the Olympics finished). We walked all around London, and ended up having a late lunch at Mildred’s (a lovely veggie restaurant) before getting the train home. On Tuesday I had to be in all day as the fence was being done. I went out on a quick run first thing, just to get some fresh air and steps, and then had to hang around at home, pottering about while the guys were in the garden. 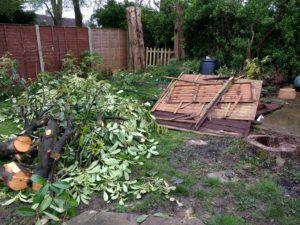 That photo shows about half of the laurel bush that had to come down before the fence was put up (to be fair the guys said they could do it with the bush there, but it was easier for them if it was gone) and then the old fence panels- what a mess! 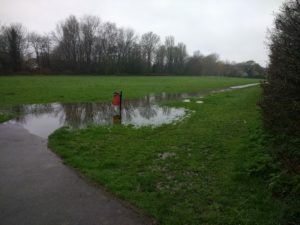 There’s a path under that puddle somewhere! Wednesday was a quiet day- a 6 mile run first thing, breakfast and pottering at home including more wallpaper stripping and then the big job of sorting the tea cupboard. It was a total mess but I put a lot of the loose leaf teas into little jam jars (with the labels), and it looks so much neater now. 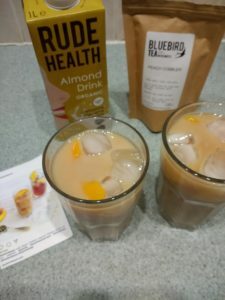 I decided to use some of the peach cobbler tea to make a tea latte (you make the tea, leave to cool then top up with milk, ice and peach slices). It was really good- I shall make it again for sure. 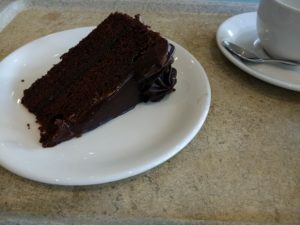 I walked into town to meet Andy as we had a cake voucher for John Lewis, so we shared this fudge cake which was rather nice. 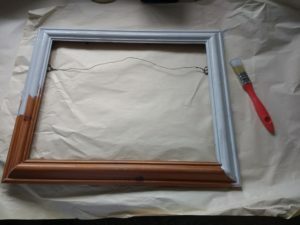 I also started a little job of painting some photo frames. I was pretty pleased with how they turned out- they are going to go up in my office. Thursday was a work day, and in the evening we went to the cinema to see Thoroughbreds, which was a bit like Strangers on a Train or something- dark and tense. On Friday morning I walked into the station and then headed into London to meet with some friends. We had booked afternoon tea at the B Bakery (the one that also does the afternoon tea bus). 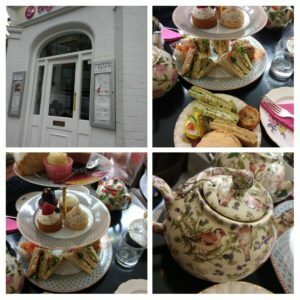 It was such good food (one of my friends can’t have dairy at the moment and they now do a vegan afternoon tea so she was very happy). I loved their teapots so much, especially the bird one. When they asked if we wanted more tea, instead of topping up with hot water (which is fine) they got fresh tea and teapots- we could have chosen a different blend but I stuck to the one I had chosen as it was so good- I think it was called After Five, it was black tea with cocoa and mint. I shall save Saturday for another post as I decided to have a little parkrun adventure to finish the holidays with. Do you like afternoon tea? Where is the best one that you have had? 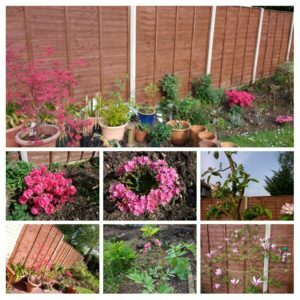 Author Maria RunsPosted on April 22, 2018 Categories General ramblings, Running, Stuff I love!5 Comments on Easter holidays part 2 including number 100 at number 100! You can hover over each link to see what it means (the purple ones are all volunteer roles and you get one star for 5+ times and two stars for 10+ times (I imagine it keeps going up but that’s as many as I have done for each role). 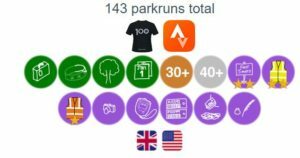 You also get flags to show the countries that you have been to (Crissy Field in San Francisco was my third parkrun course and my first real parkrun tourism). It keeps track of how many courses you have been to (which is great as I kept on scrolling up and down trying to keep count). I am not doing too badly with the alphabet challenge- 15/25 (there is not one beginning with x). It’s handy to see the missing ones. My favourite club (they are all of course totally made up clubs) is the parkrun Pirates club- you need 7 C’s and one R (I first heard this on the Australian podcast)- I only need 3 more C’s to get that one. There is also a cool stopwatch bingo, which I don’t think you could ever plan to do- basically you need a time ending in each second (01, 02 up to 50, 00)- the minutes don’t count, and I am only missing 5 (17, 18, 21, 51 and 56)- but because of trying to press start when the RD says go, I don’t think my watch is ever quite the same (and forgetting to press stop in the finish funnel) so I think that will just happen by chance. There is also “Stayin’ Alive”, which is 3 B’s and 3 G’s (I only need two more G’s), the Bushy Pilgrimage (check), New Year Day double (check). The one I am closest to finishing is the compass club- I have Eastleigh, Southampton and Westmill, so I just need a North to finish that one (and handily I need an N for the alphabet challenge so that might be my next adventure). I have also found out that if you look at someone else’s results (I often look at my Dad’s or his cousin’s) you can see their challenge progress too. 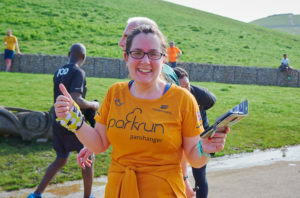 Of course the beauty of parkrun is that it can be anything you want it to be. It can be a superfast flat out effort, or a gentle outing catching up with friends and family, it can be about the community of your local one or visiting new places. 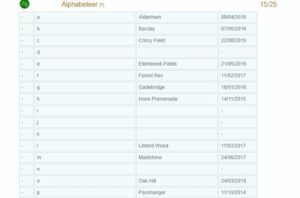 I set myself the challenge a few years ago of running all of the parkruns in Hertfordshire, which I managed to complete last year (and then added Letchworth this year once that came along), and although I have half an eye on the alphabet challenge, it isn’t easy to get some of the letters without expensive weekends away, so I am happy to find some other new challenges along the way. Do you ever set any challenges like this? Which club do you think you would be close to achieving? 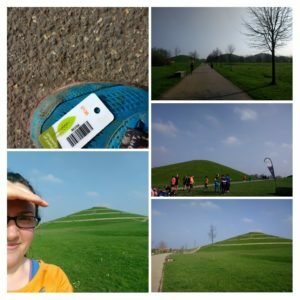 Author Maria RunsPosted on April 13, 2018 Categories General ramblings, Stuff I love!7 Comments on parkrun challenges! One of the joys of the holidays is that I can get on top of the blogmin- I do not know how many emails I have deleted this week (does anyone else get so much spam about bluetooth speakers? ), but every now and then I find a good one. I was emailed a while ago to say I was listed here on the UK top 75 running blogs. They also do a list of Top 50 UK Baking Blogs list (I didn’t even know that the GBBO had a blog…) which is worth looking at if you’re into baking at all- I’ve found a few new ones to follow. The best email to get was about the Skid Row marathon film. 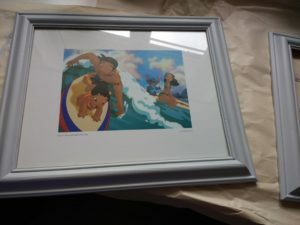 I went to see this in London last September when the Marathon Talk podcast held a special screening. It was a fantastic film, and it is very exciting that there are now going to be screenings all over the UK. You can see the trailer on You Tube here. From their press release: After amassing an incredible 13 awards from 10 different US film festivals during the 2017-2018 season and critical acclaim in the US press, documentary Skid Row Marathon is having its first official cinema release in the UK this Summer. The film will be will be distributed by CinEvents as an exclusive, one night only, Event Cinema release on Wednesday 9th May 2018 in over 100 selected multiplex and independent cinemas nationwide. The film will be released in association with The Big Issue, Runners World, The Running Charity and Marathon Talk. Skid Row Marathon is the truly heartwarming and inspiring story of an unlikely group of individuals from LA’s Skid Row, an area well known for being impoverished and forgotten by society. The feature-length documentary focuses on the story of Los Angeles Superior Court Judge Craig Mitchell over a period of 4 years as he coaches a long-distance running club from the Midnight Mission on LA’s infamous Skid Row. Using the liberating power of running, the marathon training raises the spirits of Skid Row’s inhabitants and gives them a sense of purpose and a new lease of life. If club members refrain from drug abuse, stay off the streets and out of prison, the Judge will take them around the world to run marathons. Directed by Mark Hayes, this moving film documents the runners as they fight the fierce pull of addiction and homelessness at every turn. It’s a story about second chances and overcoming obstacles. With the surge in numbers of rough sleepers in the UK in the past year, Skid Row Marathon acknowledges the devastating effects homelessness can have. It showcases what the discipline of running and the power of friendship can do to change lives. Skid Row Marathon was produced by Gabriele Hayes and Doug Blush. Blush is an award-winning producer, editor, and director who has worked on such films as 2018 Academy Award Best Documentary winner Icarus, 2012 nominee The Invisible War, and 2013 Oscar Winner, 20 Feet From Stardom. I found the film really interesting, really emotional, and really relevant to life over here. There are so many news stories about the number of rough sleepers in the UK increasing, and you don’t need to be interested in running, but just interested in people. Tickets are available here, so check out if there is a screening near you. Seriously- go and see it. (I was emailed the info through, but I am just happy to share it on here because I think it’s great). Finally I was emailed about a new event, the Ciderthon. It’s a half marathon with a cider taster every mile taking place in Wells, Somerset on the 29th of April. The event will be showcasing local ciders, raising money for Dorset and Somerset air ambulance while bringing runners from across the country to try a new challenge! As someone who doesn’t drink, the cider part doesn’t appeal but it does look like a pretty route. You do have 6 hours so you could do it as a long walk I suppose. If you use the code Maria10 it will give you 10% off at checkout. Have you seen the Skid Row Marathon film or would you like to? Do you like films about running? I was so annoyed when I accidentally recorded Breaking 2 on HD (when we didn’t have that channel in HD) so I still haven’t seen it. I saw a great film about the Barkley marathons on Netflix. Do you get a lot of random emails about your blog?